The audit log is a record of various activities performed by users in Dentrix Ascend. On the Home menu, under Reports, click (or tap) Audit log. The Audit Log page opens. On the Audit Log page, the log displays events for the current date by default. For each event in the audit log, the date, user, and description appear. Date Range search - To search for events within a specific date range, select a date (today, yesterday, or a specific date) or range of dates (last 7 days, this month, last month, or a custom range) from the list. Date/Time and other column sorting - To sort the list in ascending order by any of the columns, click (or tap) the desired column header. Click (or tap) the same column header again to sort the list in descending order by that column. User - To search for events performed by a specific user, select a user from the list (the Office Manager option does not correspond to any user). To search across all users, select the blank option. Location - To search for events performed in specific locations, type a semicolon-delimited list of the names of those locations. The current location is selected by default. To include an additional location, click (or tap) in the search box to insert a text cursor after the semicolon, and then select a location from the list that appears (only locations with at least one event are listed). Type - To search for events by type (if applicable), such as perio exam or clinical note, select the check boxes of the desired types, and then click (or tap) Apply Selected. 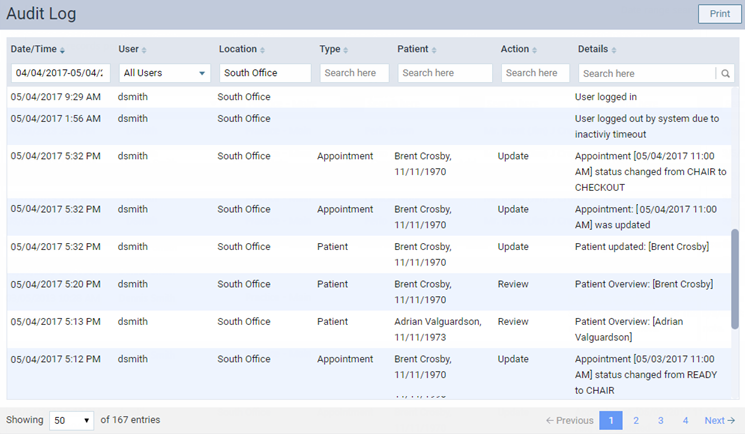 Patient - To search for events by patient (if applicable), begin typing a patient's first name, continue typing to narrow the results, and then select the desired patient. Action - To search for events by action (if applicable), such as add or delete, select the check boxes of the desired actions, and then click (or tap) Apply Selected. Details - To search for events by a keyword in the description of the event, enter your search criteria. Who is the user Tami Ascend in the audit log?